Few things are more perfect than crusty pieces of bread topped with delicious things. Bruschetta, crostini, tiny crunchy toasts – no matter what you call them, they are delicious! Today I’m working with Sabra again (pinch me! I love working with with this great company! ), and I have dreamed up the most delicious crostinis ever – Mexican guacamole bruschetta! This is going to be the talked about appetizer or dish at your 4th of July cookout. Make it! 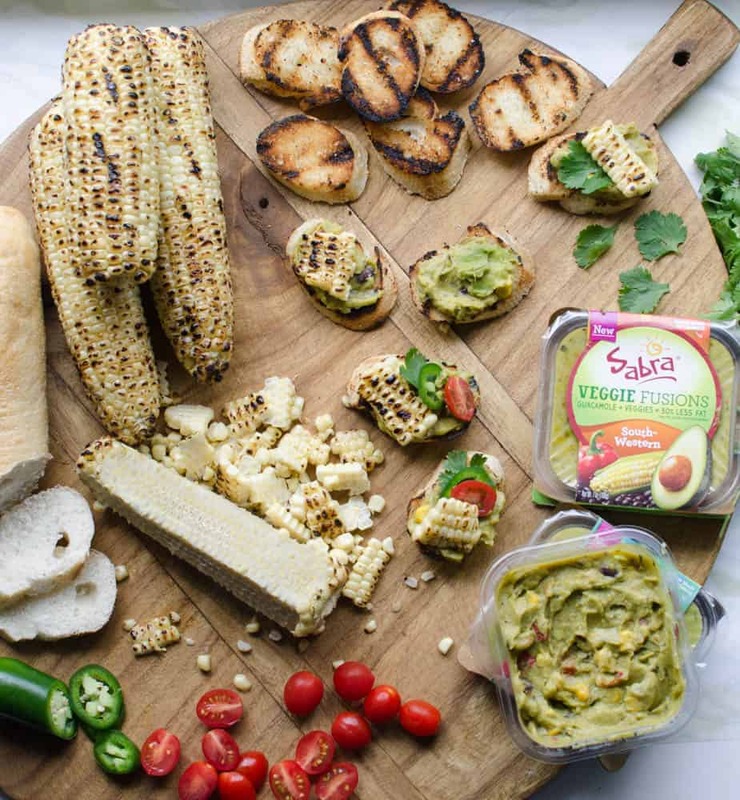 This simple but perfect finger-food is buttered baguettes, grilled to perfection, grilled blistered sweet corn, Sabra’s new Veggie Fusions South-Western Guacamole, a little tomato, cilantro, and optional jalapeño. So simple, so good, so easy! I’m making these again for a party on Saturday, and then another batch for a get-together on Monday night. I can’t get enough. Let’s chat about that new Sabra Veggie Fusions guacamole for a minute. It’s like delicious traditional gauc, but it’s packed with 7 different vegetables. The South-Western flavor that I loved had little bits of peppers, tomatoes, corn, black beans, and more. It really fun to dig into. Because there are vegetables hanging out in the gauc, it happens to have 30% less fat than classic guacamole. That means you can eat more of it, right?! The Garden Vegetable and Mango Lime were also delicious. These Veggie Fusions guacamoles are musts this summer, and I can’t wait to hear which is your favorite. This dish is made on the grill and it will take about 20 minutes from start to finish to get everything cooked and assembled. 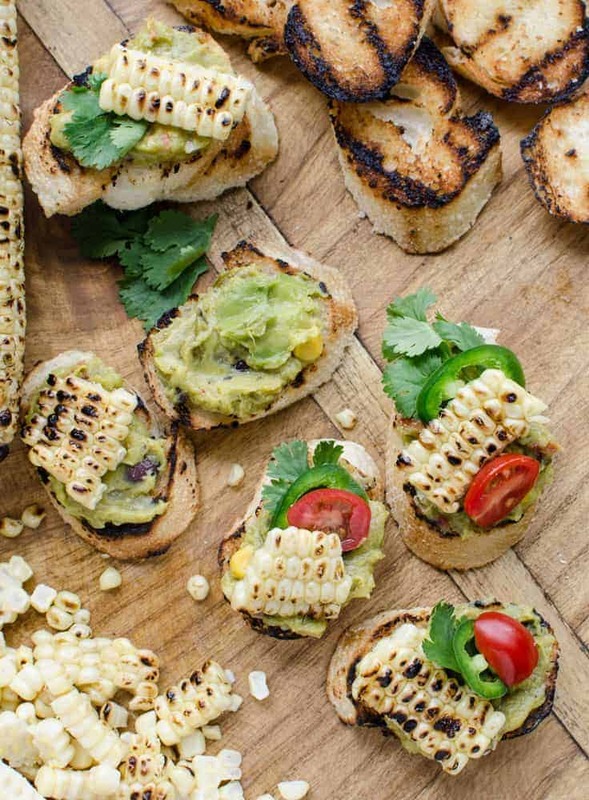 It won’t heat up your kitchen, and guacamole bruschetta is the perfect thing to throw on the grill while people are starting to show up and you are prepping the rest of dinner. They can munch on them as you get everything put together, and everyone will be happy. 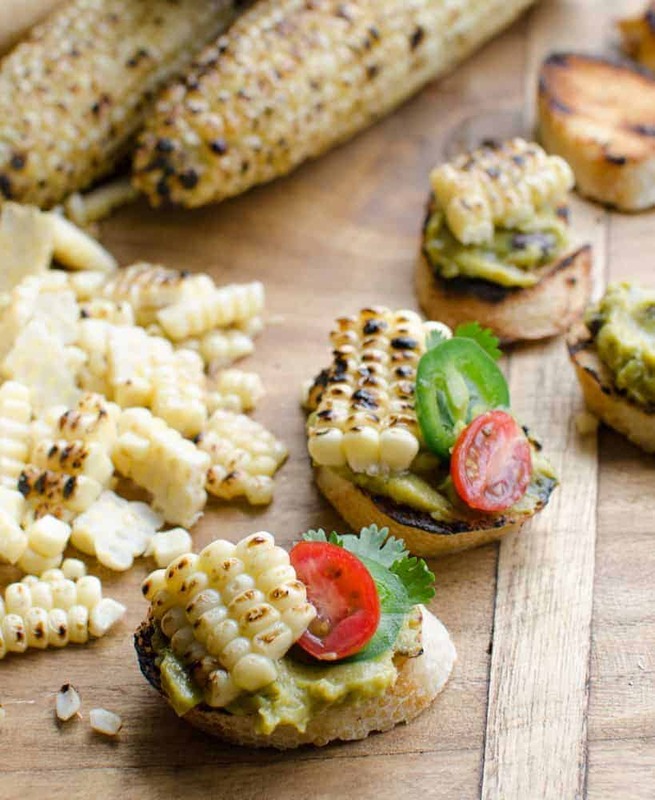 The crispy bread, the charred sweet corn, the creamy chunky guacamole, the acid from a bit of tomato, plus cilantro and jalapeño – you’ve never had so much flavor packed onto one little piece of toast. Simple seasonal dishes are my favorite, and this one is at the top of my list this summer. My friends over at Sabra want you to try their new Veggie Fusions as much as I do, so they have provided a coupon for you. You can print a one dollar off coupon here. Yay! Craving more? Subscribe to Bless this Mess to get new recipes, meal plans, and a newsletter delivered straight to your inbox! If you try this guacamole bruschetta, let me know what you think! Leave a comment, pin it, and don’t forget to tag a picture #blessthismesseat on Instagram. I love to see your kitchen skills in action! Slice the baguette on a bias, about 1/2 an inch thick. Butter one side of each toast well. You’ll want to cover the side of the bread completely with a thin layer of butter. Head out to the grill with the corn and the buttered bread. When your grill and grill grate is nice and hot, add the corn and bread, butter side down. You’ll want to allow the bread to cook until the edges start to brown and crisp, about 3-5 minutes. Cook the corn, rotating a few times as needed, until all sides are lightly charred, about 6 minutes. Remove the corn and bread from the grill as it is done cooking. Place all of the grilled toasts on a large platter and carefully cut the corn from the cob, try to cut of large pieces of corn that stay together (cut deeper into the cob if you aren’t getting chunks of corn falling off. 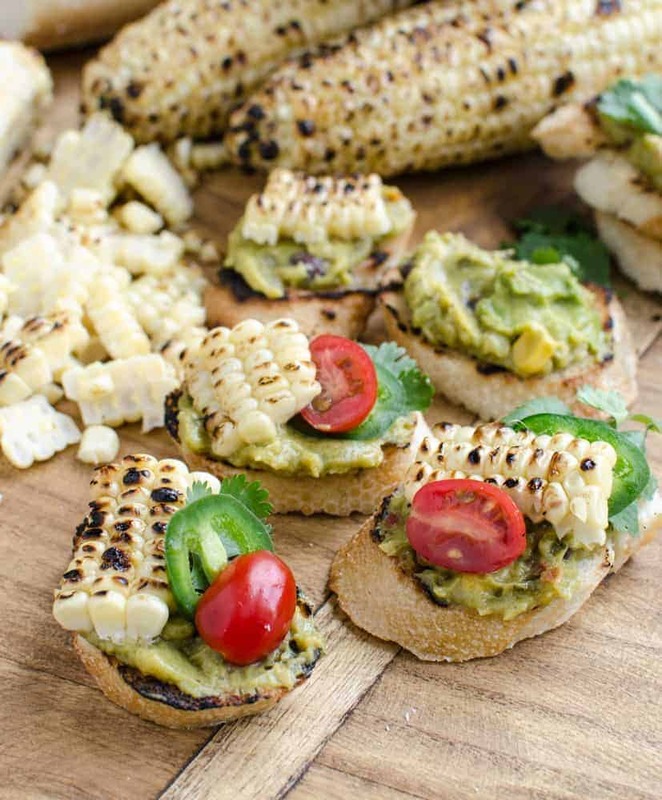 Add a layer of Sabra Veggie Fusions South-Western Guacamole to each toast (on the toasted side), top with grilled corn, a half of a cherry tomatoe or two, a leaf of cilantro, and the thinly slices guacamole is desired. Serve right away. Aren’t they gorgeous? That grilled corn is amazing. Make a bunch of extra and throw it in everything from salsa to salad. You won’t regret it. I did notice that some of the kernels burst and sprayed a little bit while cooking, so be careful using the grill and cooking them. It wasn’t a big deal, but I thought I’d mention it. Thank you so much for enjoying this fun guacamole bruschetta with me. Can’t wait to hear how much you loved it. If you are hosting or heading to a cookout this week, you might also like my festive Red White and Blue Cheesecake Brownies (so pretty! ), my mom’s famous Seven Layer Salad, my husband’s favorite Potatoes Au Gratin, or this Cake Batter Ice Cream. Eat on friends, eat on! Disclosure-this post is in partnership with Sabra, but our opinions are our own. Thank you for supporting the brands that continue to make Bless this Mess possible. Oh yes! This is on my must try list!!! Myself and all my friends will love! Pinning!